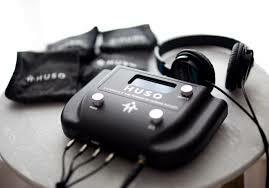 HUSO (Human Sound) is a cutting edge and patented sound frequency therapy that re-balances the autonomic nervous system. It is also meditative and relaxing and activates higher levels of healing, thus creating a treatment for the body, mind, and spirit. When you walk into a HUSO session, you will lay down on a heated Biomat and watch the beautiful Light Labyrinth crystal. Then, we will put bands around both ankles and both wrists, place a pad on your stomach, and give you a pair of noise canceling headphones. Together, we will choose a tone frequency depending on your condition/goals for the treatment. Once the tones play, they are pulsed into your wrists, ankles, stomach, ears, and through the entire body. Activates the parasympathetic nervous system. This drops blood pressure about 10-20 points and takes great stress and inflammation out of the body. Calms, grounds, and balances someone in a totally noninvasive way. Clients, even if they fall asleep, end up with brainwaves in alpha or theta state. This means that your brain is in a higher state of consciousness. People feel lighter, calmer and more in control of their lives. It’s difficult to imagine our lives without technologies like cell phones, wifi, the internet, etc. as they’ve become so integral to our functioning society. However, all of these technologies operate on different variations of electromagnetic (EM) frequencies, most of which are harmful and disruptive to biological systems (like us). Recent scientific research has highlighted that our cells operate and communicate on their own EM frequency 1. Long term disruptions to these frequencies have negative effects on our immune system and our gut, resulting in chronic inflammation2. The Bad news: unfortunately, due to our technologically advanced society and the constant presence of high energy EM frequencies all around us, it is difficult to escape this long term disruption. The Good news: you can restore your body back to its natural frequency by taking advantage of the physical properties of sound waves. This is where HUSO comes in. To understand the power of HUSO, it’s important to understand two things. One: Your body is a perfectly conductive biological system and is therefore very sensitive to electromagnetic frequencies, which means it’s easy to disturb your body’s natural rhythm. Two: By introducing an external vibration (a sound) that aligns to your body’s natural resonance frequency, through a phenomenon known as entrainment, it is possible to restore your body’s rhythm back to normal4,5. HUSO is unique in the sound therapy niche because it utilizes human generated sound, to which our bodies naturally respond and understand (AKA resonate with). In fact, last year it was discovered that there exists a brain-to-brain entrainment (synchronization) between two people having a conversation3. Using sensors placed around your wrists, ankles, and stomach, naturally resonating sound frequencies are introduced into your body and entrain your body’s rhythm back to normal. It is a powerful, noninvasive method of recalibrating our body’s nervous system, bringing you into a state of deep relaxation and calm, reducing inflammation and stress levels. How does sound therapy reduce inflammation? Imagine you have an army lying dormant all over your body, sleeping in barracks ready to protect its homeland (you). Almost any tiny perturbation to your body’s resting homeostasis will sound your immune systems’ alarm bells and those soldiers will wake up and launch all over your body to find the intruder. At any given moment, our immune system is fighting off some kind of intruder without our being aware of it, operating on a basal level of activity that our bodies are designed to handle. It’s when this basal level of activity increases that we begin to experience chronic inflammation all over our body. Now consider this. What if that intruder isn’t a bacteria or virus, which is what these soldiers are trained to destroy best? What if it’s even stealthier? What if it’s from high levels of high energy EM frequencies coming from our technologically advanced society? You may not know this, but every one of your cells emits its own subtle, low-level electromagnetic frequency, including your immune cells. While it’s not a widely accepted medical fact yet, more and more research is revealing that a major aspect of cell-to-cell communication is via resonance signaling between each cell’s own EMF signals1. When our body’s natural frequencies are disrupted with prolonged exposure to high energy, powerful EMF’s, the cells in our body can no longer communicate as efficiently. This communication disruption in our immune cells causes them to wake up and launch a low-level immune response4. Remember, any perturbation to our body’s homeostasis will signal our immune system to get to work. This means that our immune system is working harder than ever before in history from the constant barrage of (1) bacteria and viruses and (2) high-energy EMF. To maintain this constant level of activity takes a lot of energy, causing us to be more tired. It also makes our immune system weaker so that it often cannot launch as big a response against a particularly strong invader when it needs to. What does this mean for us? It means that we’re more tired and sicker than ever before. Now I can get around to answering the original question, how does sound therapy reduce inflammation? It recalibrates our neural and cellular frequencies back to normal, restoring normal cellular communication, and thus reducing the load on our immune system, which ultimately reduces inflammation all over our body. This is why HUSO is so powerful. Foletti, A., Grimaldi, S., Lisi, A., Ledda, M. & Liboff, A. R. Bioelectromagnetic medicine: The role of resonance signaling. Electromagn. Biol. Med. 32, 484–499 (2013). Singh, S. & Kapoor, N. Health implications of electromagnetic fields, mechanisms of action, and research needs. Adv. Biol. 2014, 1–24 (2014). Pérez, A., Carreiras, M. & Duñabeitia, J. A. Brain-To-brain entrainment: EEG interbrain synchronization while speaking and listening. Sci. Rep. 7, 1–12 (2017). Guerriero, F. & Ricevuti, G. Extremely low frequency electromagnetic fields stimulation modulates autoimmunity and immune responses: A possible immuno-modulatory therapeutic effect in neurodegenerative diseases. Neural Regen. Res. 11, 1888–1895 (2016). “Resonance.” The Physics Classroom, www.physicsclassroom.com/class/sound/Lesson-5/Resonance. “What Is Brainwave Entrainment.” Brain Works, www.brainworksneurotherapy.com/what-brainwave-entrainment.